A revolutionary, fully-integrated power system for work trucks. 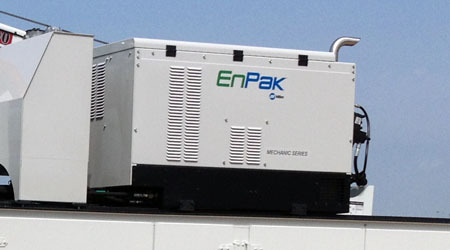 EnPak® combines a rotary-screw air compressor, hydraulic pump, generator and a 24.8 HP, Tier IV Final diesel engine in a single unit and is fully-functional with the truck turned off. We can subsitute an EnPak for any of our Units in Inventory. We can also retrofit an existing unit with an EnPak usually within 2 weeks. Click Here to Request Pricing.